Not only are people, on average, living longer today, they are remaining in better health than in past generations. Yet myths and stereotypes about old people are more common than facts and knowledge. The University of Vermont’s Certificate in Gerontology takes a multi-disciplinary perspective to the study of aging that aims to challenge those misconceptions and replace them with information firmly grounded in reality. Through the Certificate, students will gain foundational knowledge of biological, psychological, and sociological aging; learn about direct practice and ethical issues common to working with elders; and consider the effectiveness of social service programs, public policies, and other forms of services, resources, and settings designed to support elders. Students who complete the Certificate will gain specialized knowledge and skills that prepare them for entry-level, aging-related career fields or for advanced study in gerontology, and will be prepared to participate more effectively in their own aging processes, with elder members of their families and communities, and on age-related institutional/policy-level endeavors. The 15-credit certificate program is designed to enable professionals already working with elders in various careers to earn an academic credential in Gerontology that may be useful to their career advancement. Students may also enroll part-time or take individual courses. 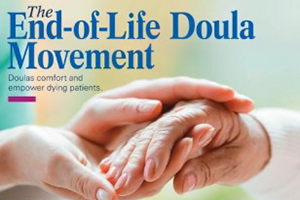 Doulas have traditionally supported women during childbirth, but recently there has been a surge of interest in learning how to support people at the end of life as well.